The Phantom is a legendary aircraft and a veteran Cold War warrior that was built in massive numbers (5000+) and is well documented as an aircraft. A little less documented are the uniquely British Phantoms which served with the Royal Navy and RAF between 1966 and 1992. 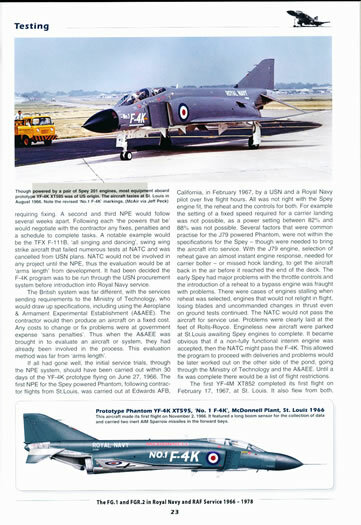 Volume 4 in the Airdoc- Doubly Ugly series “The Ultimate F-4 Phantom II Collection” is the first part of a two part set devoted to British Phantoms and covers their service from 1966 until 1978. It follows Doubly Ugly’s excellent volumes on Israeli and USN / Marine Phantoms. The earlier titles were landmark in the genre and are a must have for the Phantom fan as this reviewer is. When I first reviewed their Israeli Phantom titles in 2010 I swore I would purchase a similar title on UK F4’s if they ever released one and have done just that. When I managed to get my hands on this book I spent most of the night reading it and carefully digging out my 48th and 72nd British Phantoms. Like the volumes that precede it, the quality of this publication is first class and it is presented in a way that just makes you want to read a few pages more before putting it down. The British were one of the first foreign customers for the Phantom which was originally sourced for the Royal Navy due to the shambolic nature of Defence Procurement in the late 50’s – early 60’s which saw the cancellation of many well advanced projects. One such project was the supersonic multi role VTOL P 1154 which was originally being designed for the RAF but was also considered to replace the incumbent Sea Vixen serving on the RN’s Fleet Carriers. When the P 1154 was Cancelled the RN who were being heavily courted by Mc Donnell Douglas, went with the Phantom instead. As the RAF no longer had a suitable Frontline Fighter in the Pipeline they had to follow the RN and jumped on the Phantom Bandwagon. To appease the devastated British Aircraft industry a lot of the sub contracting and final construction of the Phantoms was done in the UK and to address safety and commonality concerns it was decided to modify the airframe to fit the Rolls Royce Spey engines which proved problematic for a few years to come. The RN had their numbers slashed with the cancellation of their new Fleet Carriers and took only 29 of the RN FG1 variant and the Remainder were transferred to the RAF for Mainland Air Defence. The RAF took the remainder of the total 170 UK Phantoms and initially operated them in the Strike and Strike Recon roles until the BAC Jaguar entered service when they were re roled in the Air Defence role which they served in until retired in the Early 90’s. 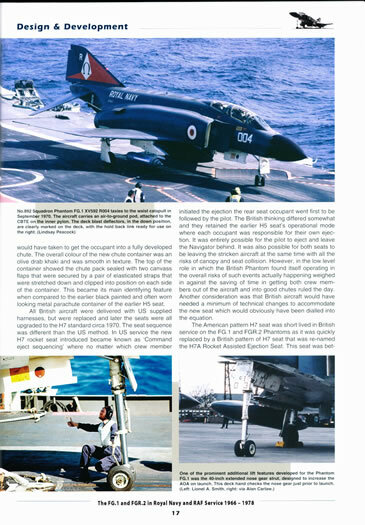 An additional 15 reconditioned US Navy F4J were purchased in the early 80’s for the RAF which served with little modification in the Air Defence role. 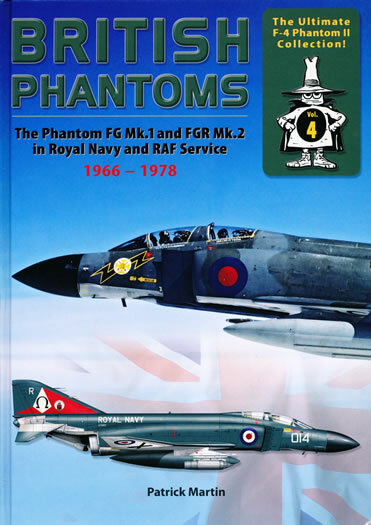 The books details everything you wanted to know about British Phantoms and unearths an amazing amount of new information on their service and the background including individual Aircraft histories. Unlike the earlier titles this book does not have Scale Drawings although they may be in Volume 2 which is devoted to the post 1978 operations by the RAF. The book covers in detail the significant differences between the US and UK Phantoms which were not related to just the powerplant. The F4K (RN FG1) and the F4M (RAF FGR2) had UK avionics and weapon fits as well as modified nosegear (extended) in the case of the FG 1 to allow it to operate from the small RN carriers. 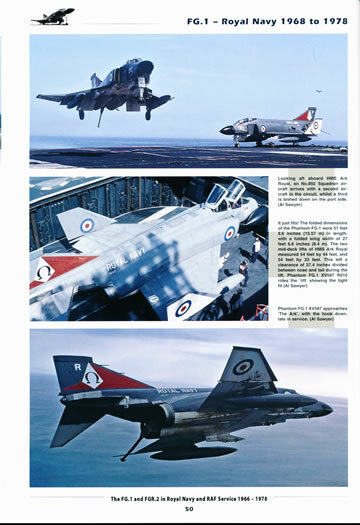 It is packed with Colour photos and has excellent colour plates of the various Squadron schemes plus overall shemes showing the standard Camouflage on markings for both RN and RAF aircraft. It even has plates of the various operators Squadron badges. Like the volumes before this title this book is well structured and balanced and covers each area exceptionally well. For the modeller the book has everything you could ask with clear and detailed photos, walk rounds and colour and marking guides. I can’t fault these volumes in any way and if the rest of the series continues like these Double Ugly ( a reference to one of the Phantoms nicknames) books will have a winner on their hands. The appeal in these titles is equal whether you are a fan of UK Phantoms, a modeller, historian or just an aviation enthusiast. 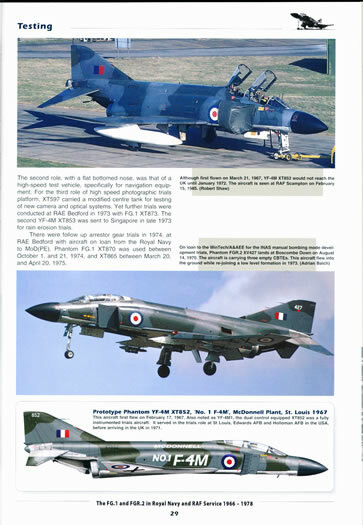 Whilst this is only part 1 it would have to be the best compiled book on the UK Phantom I have yet seen and set a great benchmark for Aircraft titles. As I said in my review of Vol 1 and 2 of this series that I would open my wallet wide if is they offered a title on UK Phantoms and I am very pleased that I did. I eagerly await Part two which covers my favourite period of UK Phantoms where many a unique and colourful scheme was sported.